I know this one isn't exactly anything new. 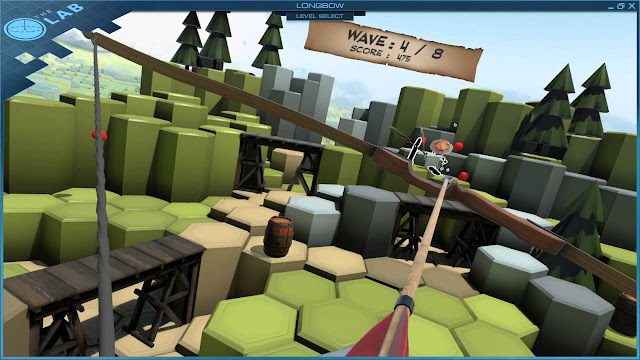 Longbow is part of Valve's The Lab released last April. I've included it in this list because it was my introduction to the HTC Vive. Wesley got first dibs on it, but I happily followed her. I was immediately impressed with the fluidity of movement and the degree to which I could let myself go within the space of the game. The incredibly natural movement of drawing and firing a bow was very faithful to the actual experience. Granted, when I've fired a bow in real life, it has never been at tiny, marauding stick figures. The Vive I wore was incredibly comfortable and the controllers were comfortable without being too heavy and the force feedback they offered as I pulled the bow back was a very nice touch. 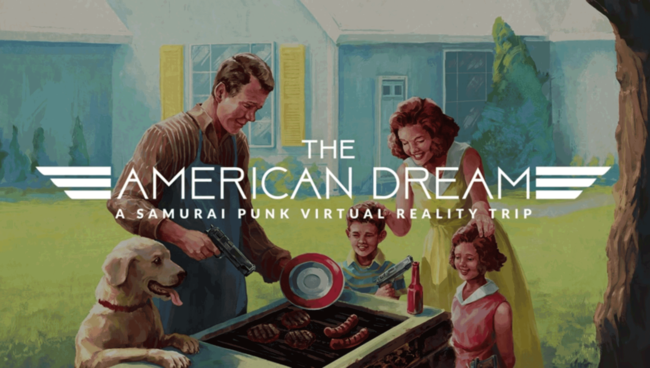 This game from Samurai Punk is a tounge-in-cheek trip through an alternate future in which guns are seem as so harmless that they are used for everyday tasks like eating, teaching babies shapes and even driving. While it is easy to mark it as a condemnation of the USA's troubling gun culture, it is more a commentary on the ubiquitous nature of guns in games. The demo I played put me through a 1950's style carnival ride, complete with hammy narration, about the wide and beautiful future that awaits people through the miracle of guns. I was taken through infancy and adulthood, stopping here and there for me to preform tasks with my guns. The idea of trying to steer with guns using them at my job at the bagel factory to put holes in bagels is ludicrous and hilarious. There was a part of me that felt guilty for having so much fun with the two deadly weapons in my hands, though looking back, I would characterize that feeling as synonymous with any well-built piece of satire. 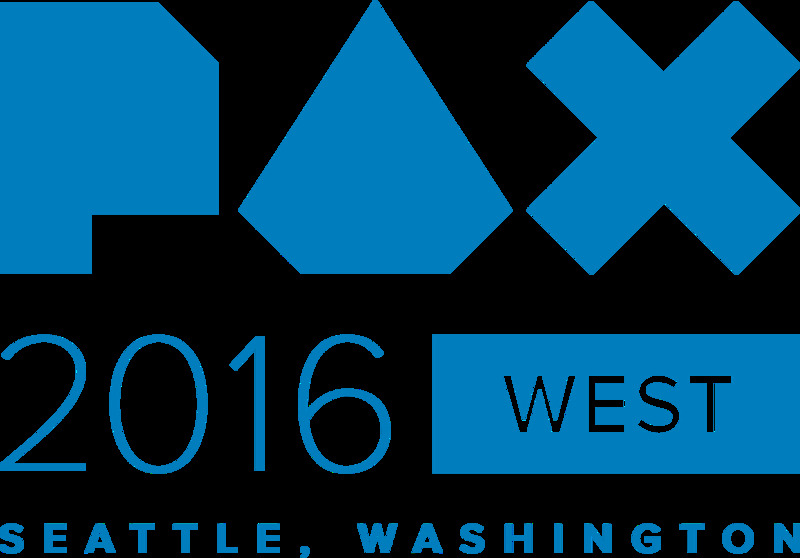 The American Dream is in its infancy at the moment, but the team is looking to release the finished game in 2017. I for one, am quite interested in seeing what the finished product looks like. This is the one game on the list that I didn't actually get to play in VR. It is supported however, and from what I've seen of the game, I expect that this will one to remember. I love me some Wipeout and F-Zero. Really, I could sit down at almost any futuristic racer and have a blast. 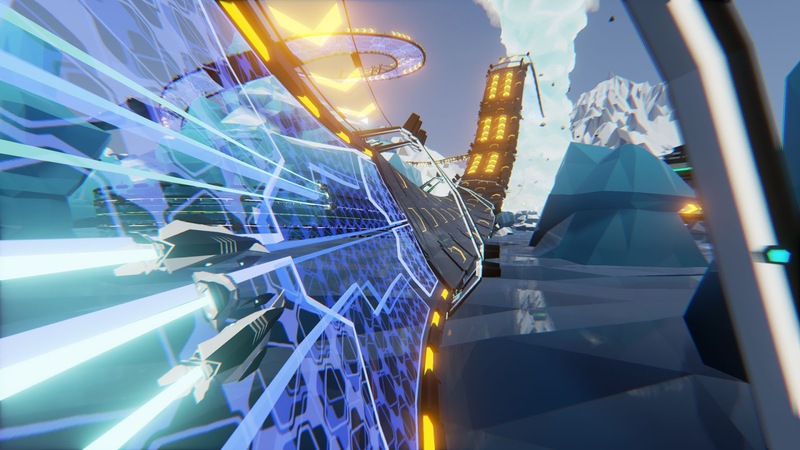 When I came across Redout in the Indie MEGABOOTH this year, I was immediately taken by it. It's a beautiful looking game, with a career mode built on the bones of Gran Turismo and the speed and tight controls to match wits with WipEout or POD.